GIMME ALL THE TACOS! 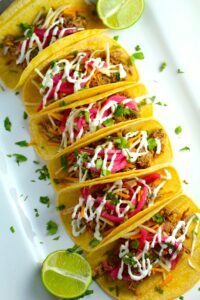 Gimme chicken tacos, beef tacos, fish tacos, bean tacos, cauliflower tacos, and of course these Slow Cooker Pork Tacos! Then top them with with Pickled Onions, Shredded Cheese, and Cilantro Lime Crema drizzled all over! 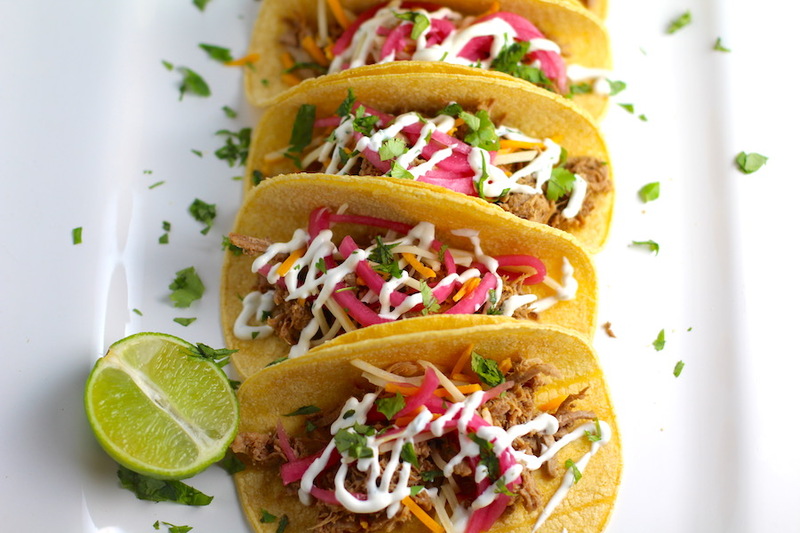 You get the salty and smoky flavor from the perfectly seasoned and slow cooked pork, a sweet and tart bite from the pickled onions, with creaminess from the cheese, and tang from the cilantro lime crema. 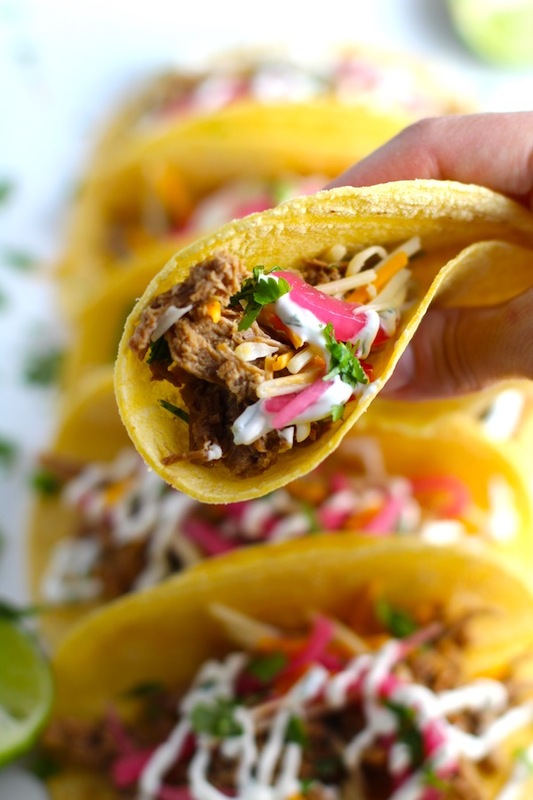 Holy cow, these Slow Cooker Pork Tacos are mouth wateringly fantastic! Picture this…you pick the kids up after a long day of meetings. You get them home, empty bags, start doing homework, and then it hits you. Crap! What can I make for dinner?? Sound familiar? Well, my friend, if you just lean on your fridge and pantry, I’m telling you, this Slow Cooker Pork Taco dinner could be yours last minute! Make the pork in a large batch on a weekend, shred it, then freeze it portioned out. Freeze the tortillas. Freeze shredded cheese. And the onions? Well, they can’t freeze, but I say just always have a jar of these on hand. Just thaw and warm everything up and put it together! Check out more Freezer Hacks to Save Dinner here! 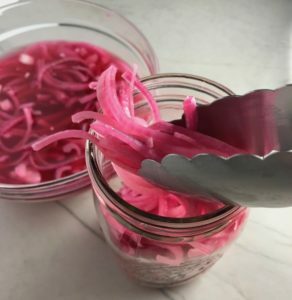 The Secret Ingredient: PICKLED ONIONS! Now, you can certainly eat these tacos without pickled onions, but seriously, why would you??? If you’ve had pickled onions on tacos, well, then you know what I’m talkin’ about. If not, PLEASE, PLEASE try this recipe, it is amazing and delicious and addictive and…just wow. 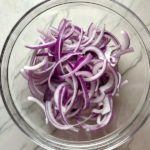 They are so easy to make as well and the beautiful pink color is natural from the Red onions sitting in the vinegar and sugar. Seriously, I cannot say enough about the YUM factor here. 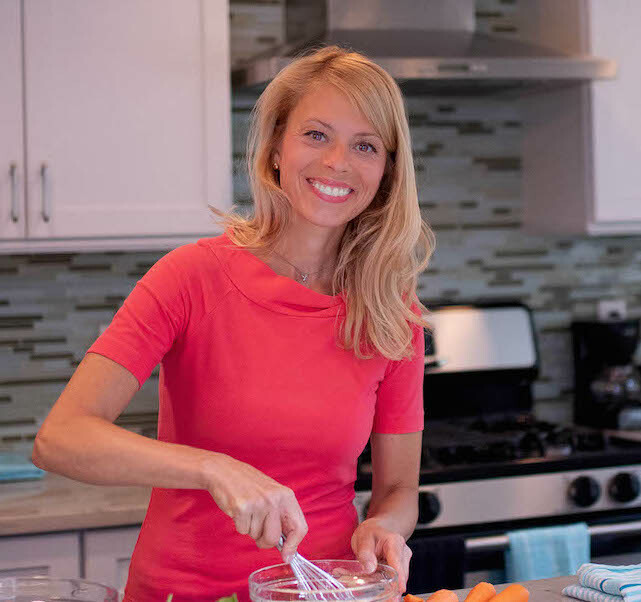 So much can be done ahead for this recipe, which is so fantastic for a busy Mom! 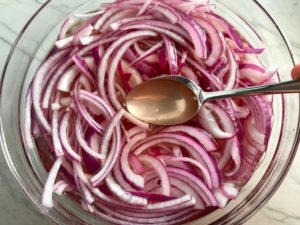 You can make the pickled onions 3-4 days in advance. The pork can be made months in advance and frozen or 3-4 days in advance and stored in the fridge. 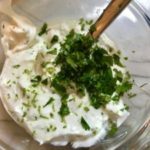 The Cilantro Lime Crema can be made 1-2 days in advance. Ok, so let’s start with the Pickled Onions! 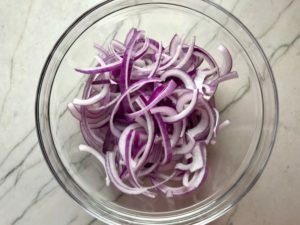 For these, you simply thinly slice the onion and then separate the slices into a bowl that is large enough to cover the onion with the pickling liquid. 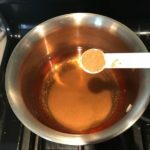 In a saucepan, bring white vinegar, sugar (or honey), and cumin powder to a boil. Then pour the hot mixture over the onions. Let sit until up to room temperature, then cover and place in refrigerator until ready to use. 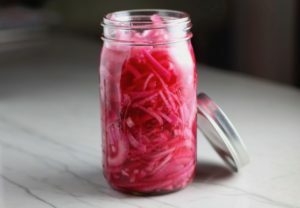 I love to make a ton of these pickled onions and store them in jars. 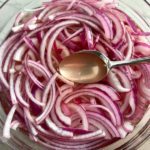 I use these pickled onions in salads, on sandwiches, in rice bowls, with grilled meats, and so much more. Crema so good you will eat it with a spoon! 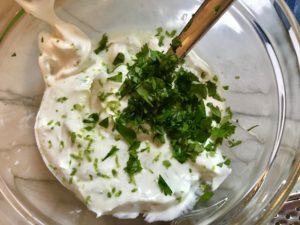 Next, we have the creamy, tangy and fresh Cilantro Lime Crema, which is nothing short of delish and it’s really everything I can do from eating it straight with a spoon. The key is the Lime zest, not just using the juice. The zest gives a more intense lime flavor without the intense sour. You can make the Crema a couple days in advance. Add sour cream to small bowl. Then add lime zest, lime juice, cilantro and salt. Mix to combine until smooth…YUM! Cook the Pork and Put the Tacos Together! Now for the pork! This recipe uses the slow cooker for a deep flavor and the most tender, fall-apart meat. Simply add everything to the pot, set for 8 hours and when it’s done, just pull the meat apart with a fork. Last, once the pork is done, wrap 12 tortillas in aluminum foil & place in the oven for 10 minutes. Turn off oven & let stay in oven until ready to eat. To serve, you can obviously add any toppings that your family loves, such as tomatoes, avocado, or different cheeses. Simply put bowls of everything out for the family to put together themselves or put the tacos together and plate them all for a stunning presentation! 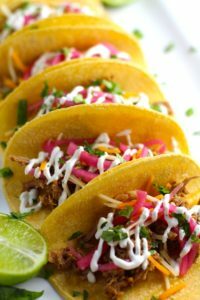 These Slow Cooker Pork Tacos are mouthwateringly fantastic! Top them with with Pickled Onions, Shredded Cheese, and Cilantro Lime Crema drizzled all over! 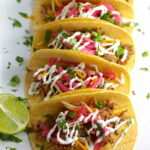 You get the salty and smoky flavor from the perfectly seasoned and slow cooked pork, a sweet and tart bite from the pickled onions, with creaminess from the cheese, and tang from the cilantro lime crema. 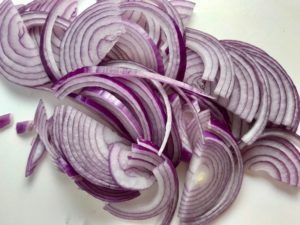 Cut the red onion in half and then thinly slice and separate thin slices into a bowl that is large enough to cover the onion with the pickling liquid. 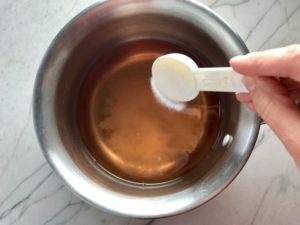 In a saucepan, bring 2 cups white vinegar, 6 Tbls sugar (or honey), and cumin powder to a boil and then turn off the heat and stir to make sure the sugar is completely dissolved. 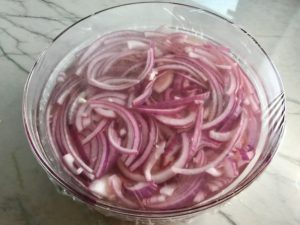 Pour the hot mixture over the onions and push onions down to make sure they are completely covered by the liquid. Let sit until up to room temperature, then place in refrigerator until ready to use. 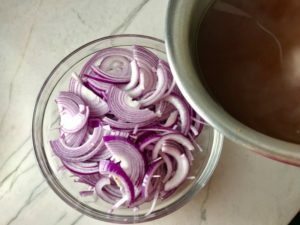 Once the onions have cooled in the fridge and pickled for a few hours, I like to transfer them into storage jars for use in a variety of dishes, such as salads, sandwiches, with meats, etc. To the slow cooker pot, add the pork, garlic, chili powder, cumin, salt, and pepper. Fill with chicken broth starting with 1 cup and pouring enough to cover the pork. Set slow cooker to 8 hours. Zest both limes and add the zest to the sour cream. Then quarter the limes and add the juice from 3 quarters into sour cream & mix to combine until smooth. Taste and if needed add juice from 1/4 more of the lime at a time tasting as you add to make sure it doesn't get to acidic. Chop some fresh cilantro for garnish. 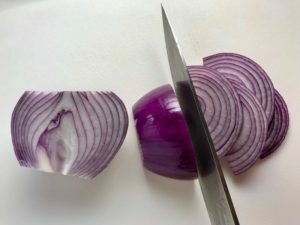 TIP: you can also snip it off the stem with kitchen scissors! For the pork, you will want to make sure to drain out the liquid so the tacos are not soggy. I like to store the shredded pork in the liquid as well as heat it up in the liquid, so I do not discard it, but rather drain it when serving. Layer the tortillas with pork, then pickled onions, then cheese, then Cilantro lime crema, then fresh chopped Cilantro. Enjoy! 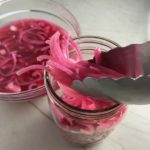 Oh My Carrie – I would definitely say these are “mouthwatering!” Pickled Red Onions are one of my all-time favorites with tacos. And the Cilantro Lime Crema looks fabulous. All of this together would make for a perfect “taco” evening. Thanks for sharing. BTW – love your photos. Aww, thanks so much Kristy! !